There is a growing trend towards a healthy lifestyle among Filipinos as revealed by the recent survey of Herbalife. 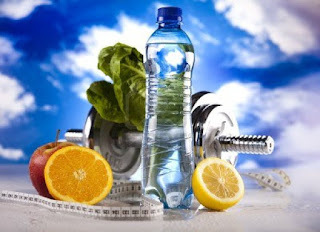 Also, a growing number of them believes that simple lifestyle changes can help improve their overall well-being. Herbalife is a 35-year-old global nutrition company that sells weight-management, nutrition and personal care products intended to support a healthy lifestyle. Herbalife products are sold in more than 90 countries to and through a network of independent members. However, living a healthy lifestyle is not that easy. According to the same survey there are key obstacles in achieving this which includes lack of time for exercise (75 percent), lack of time to make proper nutrition choices (64 percent), and high cost of healthy food (62 percent). Heart, brain and eye health were the top three aging-related concerns in the Philippines. Herbalife Health Poll Survey was conducted in September 2015 as part of its preparatory activity for their Asia-Pacific Wellness Tour. 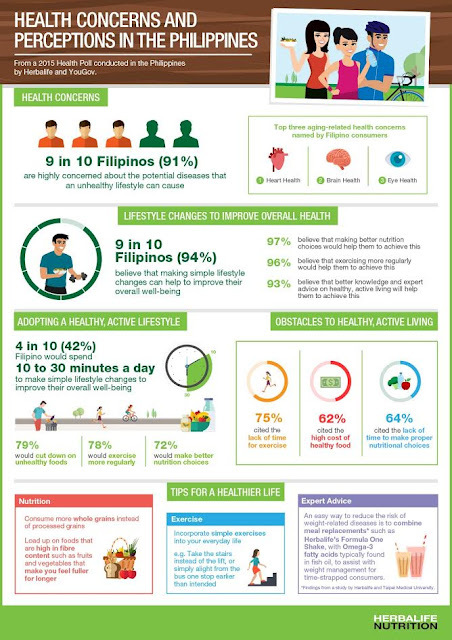 1,200 respondents across six countries including the Philippines were asked about their perceptions towards their health and current lifestyle. Part of its commitment to provide deeper understanding on a healthy lifestyle, Herbalife brings on its fourth year, the Herbalife Asia-Pacific Wellness Tour. 60,000 participants across the region had benefited from the tour in the past three years. Five members of the Herbalife Nutrition Advisory Board will be part of this year's tour. The tour will visit 14 markets and 21 cities across the Asia Pacific in the month of October. Topics will include views on how people can make use of the little time they have to make simple lifestyle changes that will enhance their well-being and views on a wide range of health-related topics like weight management, brain health and aging; heart health; immunology; and skin care. Dr. Gary Small, a specialist in brain health and aging who has authored over 500 scientific works and has received numerous awards and honors, including the “Senior Investigator Award” from the American Association for Geriatric Psychiatry. Dr. Marion Fltechner-Mors, a health nutrition specialist who is currently heading the nutrition and obesity research group at Ulm University, Germany. Dr. Wang Jae Lee, a physician and academic specializing in immunology and a professor at Seoul National University College of Medicine. Besides the wellness tour, the company supports the Herbalife Family Foundation and its Casa Herbalife program to help bring good nutrition to children. To learn more visit Herbalife.com.